I have been using the Nexus 9 for a few weeks now and I have been enjoying the overall size of it. It has been incorporated into my everyday life: social media management, emails, research, for reading, watching videos and meetings. My previous tablet was the Nexus 7 (first generation) so there is a big improvement with speed on the Nexus 9. Everything that I use on a daily basis (HootSuite, Pinterest, LinkedIn, WordPress, Inbox, Calendar, Google Now, Kindle, Epub) runs smoothly and is seamless. I can switch from application to application with no lagging. One of my favorite features of Android 5.0 Lollipop is the interactive lock screen notifications. New notifications appear on your lock screen, just like they would in the pull-down menu, and you can clear them or launch corresponding apps without swiping to unlock. Google Cards are featured more prominently in Lollipop than my previous tablet too. From the lock screen notifications to how calendar appointments / events are displayed, it is becoming the new way to interact with Android. This suggests that Google has future plans for Google Now and the Cards and how it will be incorporated into daily use. For productivity, I find it to be very helpful as it will automatically update appointments for me from my Google Inbox into my calendar and will set up the notification cards so that I don’t forget. For example, I recently made travel arrangements for a conference and when I received the email confirmation, it updated my calendar with all the pertinent information. I also like the ability to set up guest accounts and different profile accounts on the Nexus 9 / Android Lollipop. This is handy for me, as my daughter likes to play with tech too and she can customize her own profile with the apps that she likes to use without ‘cluttering’ up the way that I like to set up my screens. (Yes, I am a bit OCD about the layout of my apps). Like I mentioned in my previous post on the Nexus 9, there is no ability to turn off the vibration mode for notifications but I hope that this will be addressed in future Lollipop updates. The only other con that I came across in my daily use is that I cannot put a custom widget on the lock screen. It is not a big deal to me but would be a ‘nice to have’. I have discovered 1 app that is extremely helpful for any Android user. It is called Drippler. If you are using an Android device and have not tried the app, I highly recommend that you do. Drippler tailors news, tips and tricks and updates based on the Android version and model that you have. 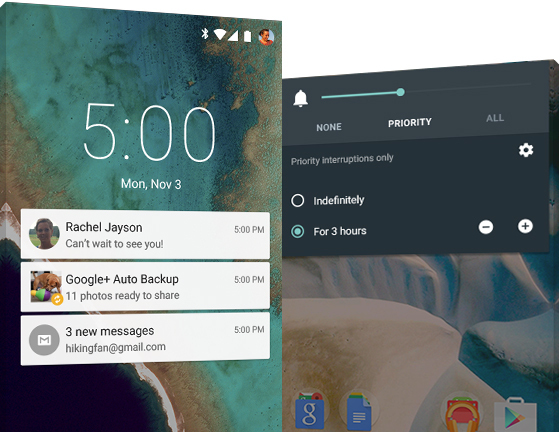 Overall Android 5.0 Lollipop is easy to use and well designed. Integrating the Nexus 9 into daily tasks has been a joy. I received a reviewer model of the Nexus 9 for this post. Good or bad, my reviews are honest with my readers best interest in mind.